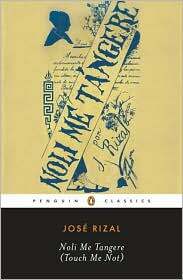 Jose Rizal’s Noli Me Tangere is perhaps the Philippines’ most influential novel. It stirred the nationalist sentiments of the 19th and 20th centuries. Its influence can be seen in present-day works of fiction, drama and films. It continues to be popular even in the contemporary Philippine setting because the reflections and insights of the book remain true today. Noli Me Tangere was written in Spanish and was published in 1887 in Berlin. The first publication was in Spanish and there was an initial 2,000 copies. Thereafter, the novel was translated into Filipino, French, German, Chinese and other Philippine dialects. The best known English translation of the book was done by Charles Derbyshire in 1912 and by Leon Maria Guerrero in 1961. This book together with El Filibusterismo is part of the school curriculum for Philippine junior and senior high school students, and the mandatory Jose Rizal course in college. Noli Me Tangere is set during the 19th century in the Philippines. Sectors of the society were represented as the novel progresses. The abusive clergy was represented by Padre Damaso and Padre Salvi, the wealthy meztizo by the protagonist Crisostomo Ibarra; meanwhile the wealthy Indio was represented by Capitan Tiago. As such, the novel offers a straightforward analysis of Philippine society under Spanish rule. The young and idealistic Juan Crisostomo Ibarra returns home after seven years in Europe. The wealthy meztizo, like his father Don Rafael endeavors for reform primarily in the area of education in order to eliminate poverty and improve the lives of his countrymen. Upon learning about his father’s demise and the denial of a Catholic burial for his father Ibarra was provoked to hit Padre Damaso which eventually lead to his excommunication. The excommunication was later rescinded upon the intervention of the Governor General. Padre Salvi, Ibarra’s mortal enemy accused Ibarra of insurrection. Ibarra’s letter to his beloved Maria Clara was used against him. Later in the story, Maria Clara will tell Ibarra that she did not conspire to indict him. She was compelled to give Ibarra’s letter in exchange for the letters of her mother before she was born. Maria Clara found out that the letters of her mother were addressed to Padre Damaso about their unborn child which means that she is the biological daughter of the priest and not of her father, Capitan Tiago. Meanwhile, Ibarra was able to escape the prison with Elias, who also experienced injustice with the authorities. Ibarra was able to speak with Maria Clara about the letters and thereafter forgave her. Ibarra and Elias flee to the lake and were chased by the Guardia Civil. One was shot and the other survives. Upon hearing the news, Maria Clara believed that Ibarra was dead; she entered the nunnery instead of marrying Alfonso Linares. The fatally wounded Elias found the child Basilio and his dead mother Sisa. The latter was driven to insanity when she learned that her children were implicated for theft by the sacristan mayor. Elias instructed Basilio to dig for his and Sisa’s graves and there is a buried treasure which he can use for his education. Noli Me Tangere brilliantly described Philippine society with its memorable characters. The melancholic fate of Maria Clara and the insanity of Sisa characterized the country’s pitiful state, which was once beautiful, turned miserable. Reading Noli Me Tangere will open one’s mind about oppression and tyranny.